Create a relevant offer At the bottom of every post on Hubspot is a call to action that gives readers more information on how to be better at social media and internet marketing. What’s remarkable about Hubspot’s call to actions is their relevance. 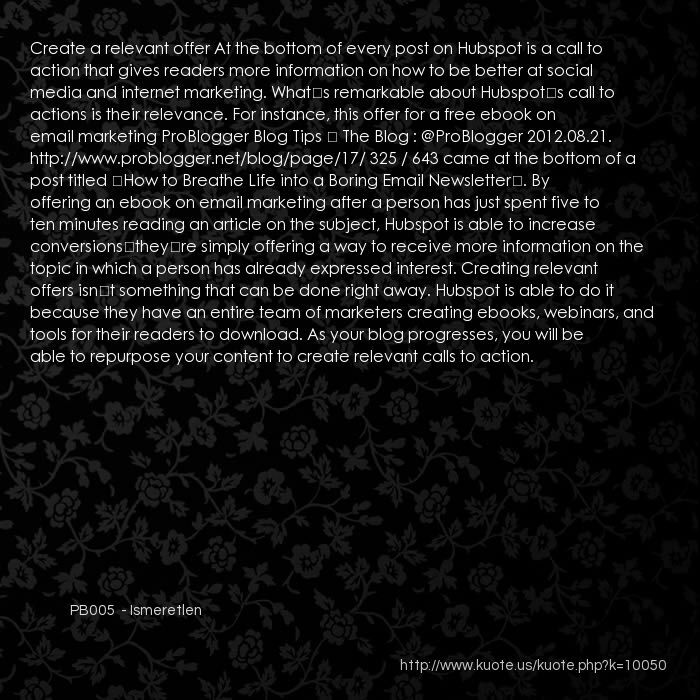 For instance, this offer for a free ebook on email marketing ProBlogger Blog Tips – The Blog : @ProBlogger 2012.08.21. http://www.problogger.net/blog/page/17/ 325 / 643 came at the bottom of a post titled “How to Breathe Life into a Boring Email Newsletter”. By offering an ebook on email marketing after a person has just spent five to ten minutes reading an article on the subject, Hubspot is able to increase conversions—they’re simply offering a way to receive more information on the topic in which a person has already expressed interest. Creating relevant offers isn’t something that can be done right away. Hubspot is able to do it because they have an entire team of marketers creating ebooks, webinars, and tools for their readers to download. 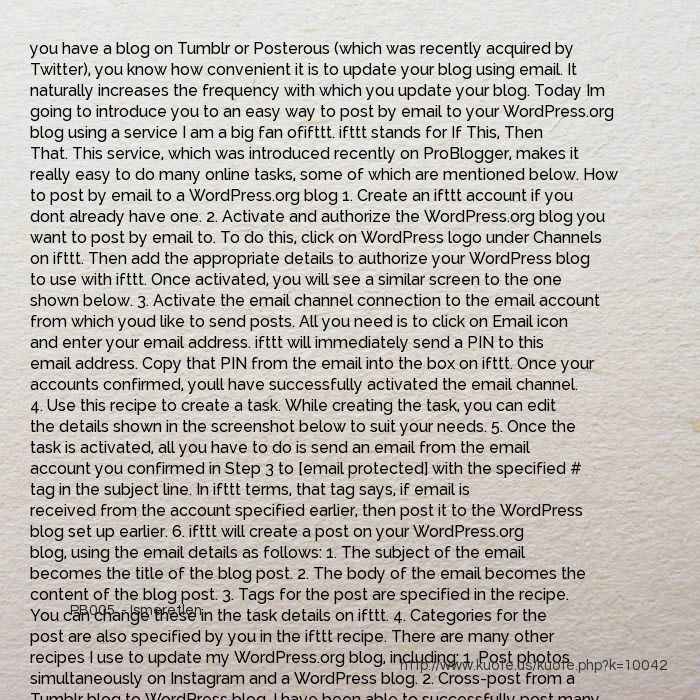 As your blog progresses, you will be able to repurpose your content to create relevant calls to action. Finally I will just go over some tools that you’re probably more familiar with, and highlight how they can be used to market your video content. Hootsuite: This social media management tool allows you to manage your Twitter, Facebook, and LinkedIn communications all in one place. You can therefore submit your video to your Facebook page, plus your Twitter and LinkedIn accounts through this tool. 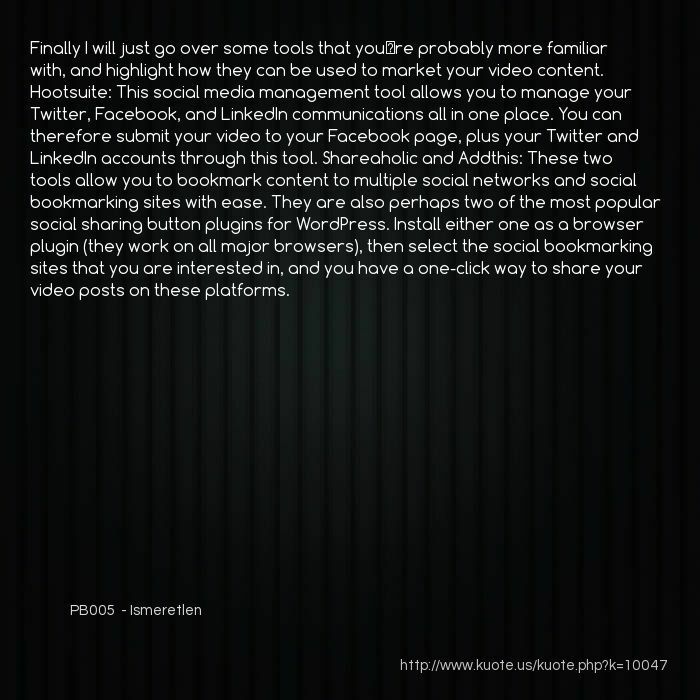 Shareaholic and Addthis: These two tools allow you to bookmark content to multiple social networks and social bookmarking sites with ease. 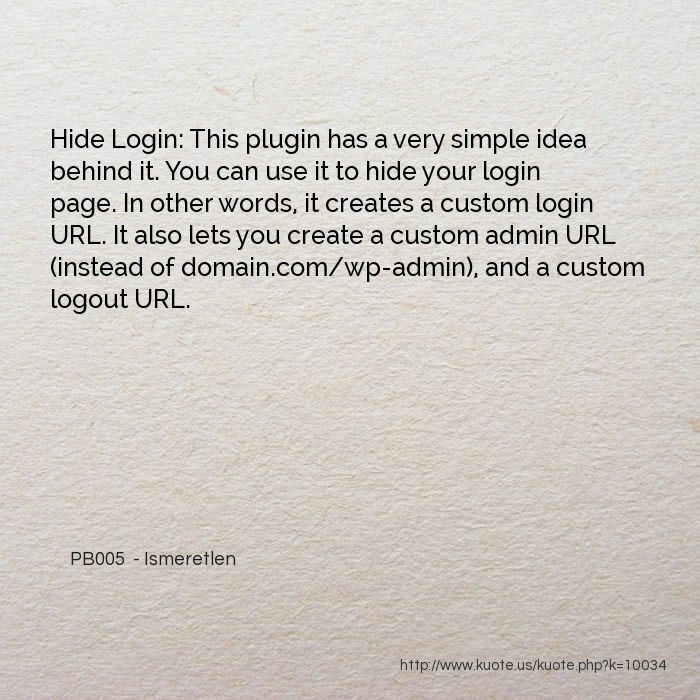 They are also perhaps two of the most popular social sharing button plugins for WordPress. Install either one as a browser plugin (they work on all major browsers), then select the social bookmarking sites that you are interested in, and you have a one-click way to share your video posts on these platforms. Video publishing There are two places on the net where your video really needs to be: 1. on your blog (or website) 2. on YouTube. Initially, you should publish the video to Youtube. If you use Screenflow to make a screencast video then you can publish straight from the platform to your YouTube channel. From Camtasia, you can go straight to Vimeo. 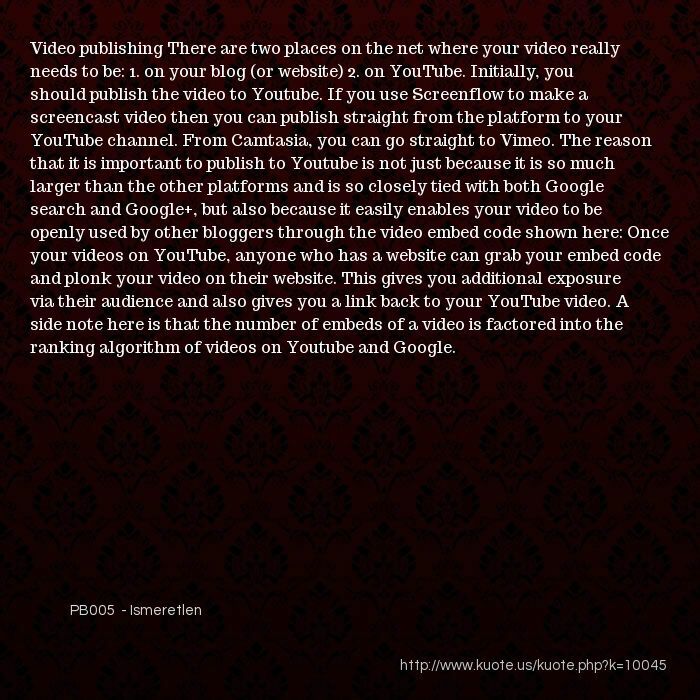 The reason that it is important to publish to Youtube is not just because it is so much larger than the other platforms and is so closely tied with both Google search and Google+, but also because it easily enables your video to be openly used by other bloggers through the video embed code shown here: Once your video’s on YouTube, anyone who has a website can grab your embed code and plonk your video on their website. 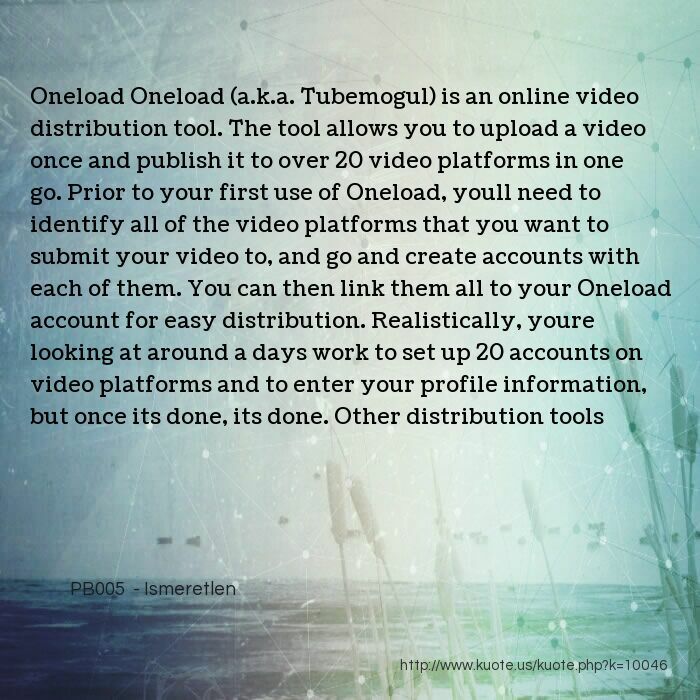 This gives you additional exposure via their audience and also gives you a link back to your YouTube video. A side note here is that the number of embeds of a video is factored into the ranking algorithm of videos on Youtube and Google. curiosity and focus. 2. Need: This is where you explain to the target audience what their need is. 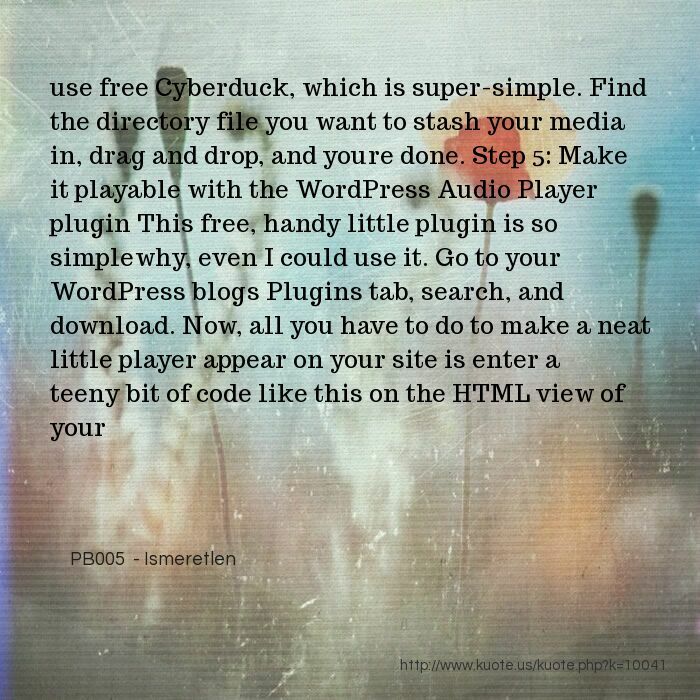 This can be an obvious, wellknown need, or a need that you create on the spot. 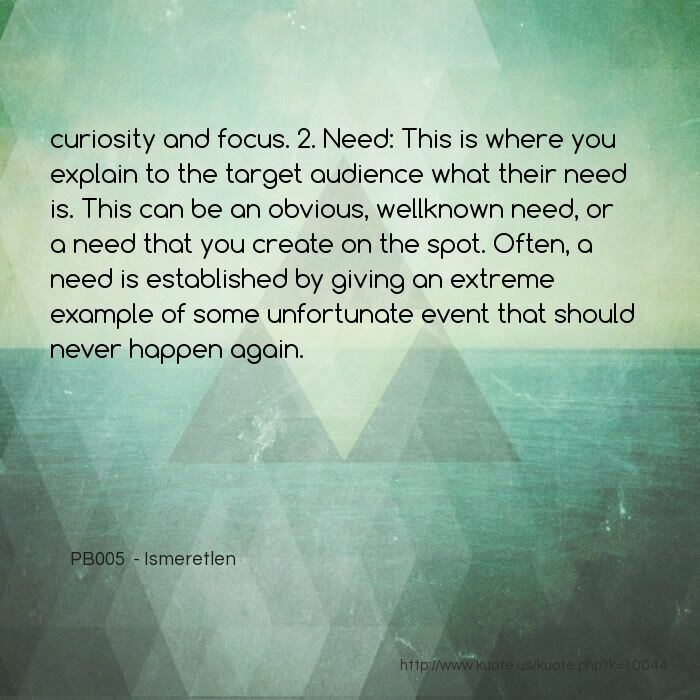 Often, a need is established by giving an extreme example of some unfortunate event that should never happen again. 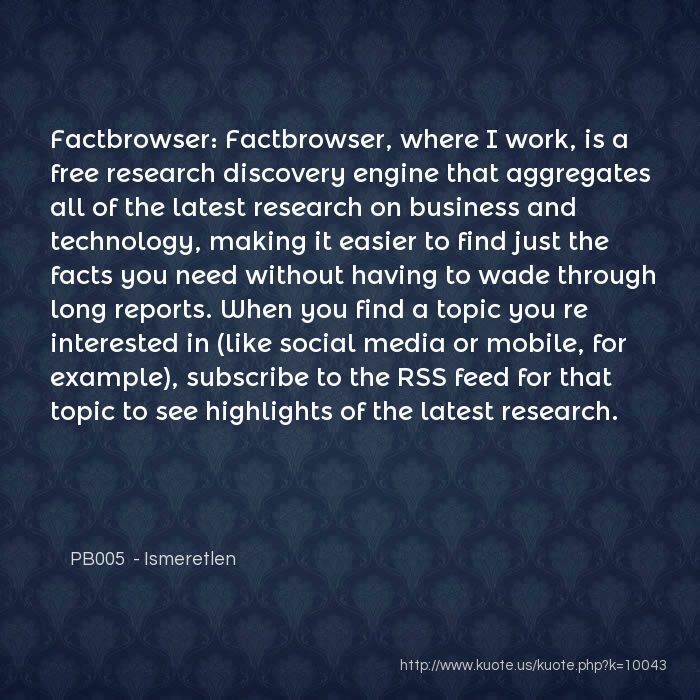 Factbrowser: Factbrowser, where I work, is a free research discovery engine that aggregates all of the latest research on business and technology, making it easier to find just the facts you need without having to wade through long reports. When you find a topic you’re interested in (like social media or mobile, for example), subscribe to the RSS feed for that topic to see highlights of the latest research. Make a random connection to find an idea: There are plenty of great posts on writing great headlines, and even more on finding ideas, but I wanted to include this little gem of wisdom that Danny Iny pointed out to me a while back: Take two unrelated things, and make them work together. 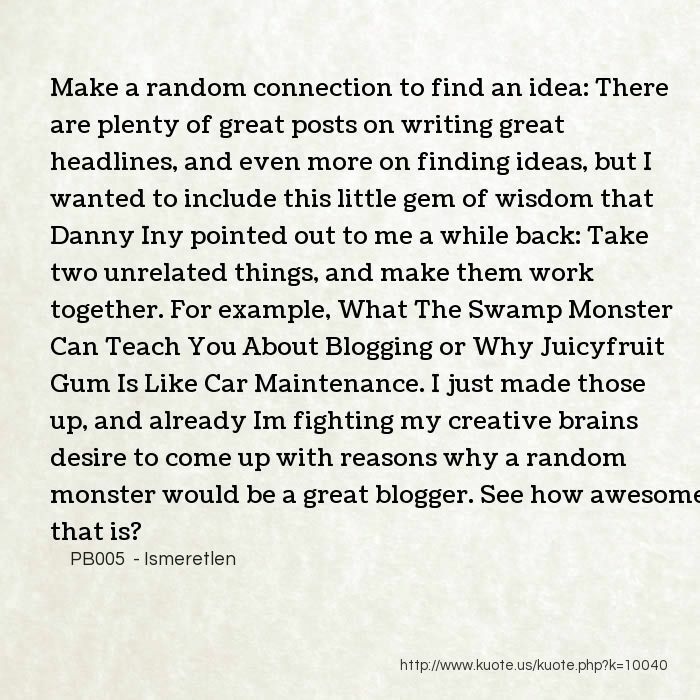 For example, “What The Swamp Monster Can Teach You About Blogging” or “Why Juicyfruit Gum Is Like Car Maintenance.” I just made those up, and already I’m fighting my creative brain’s desire to come up with reasons why a random monster would be a great blogger. See how awesome that is? 11. 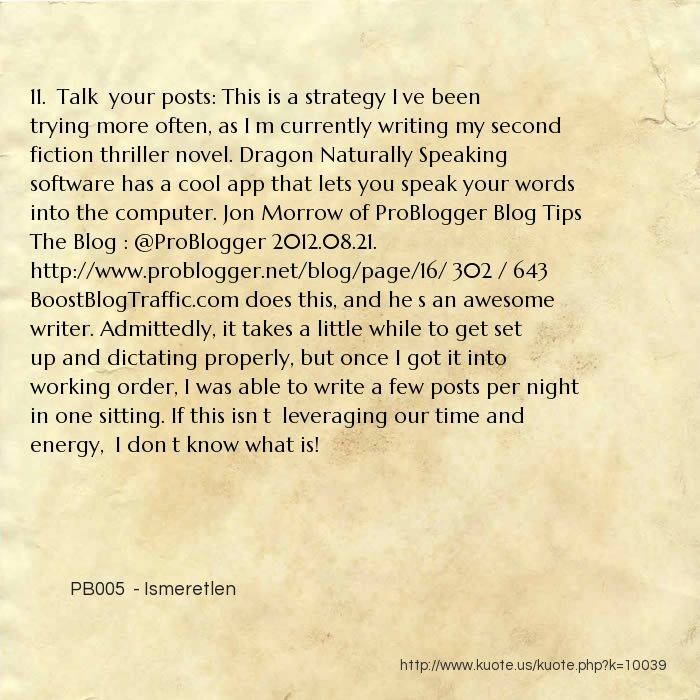 “Talk” your posts: This is a strategy I’ve been trying more often, as I’m currently writing my second fiction thriller novel. Dragon Naturally Speaking software has a cool app that lets you speak your words into the computer. 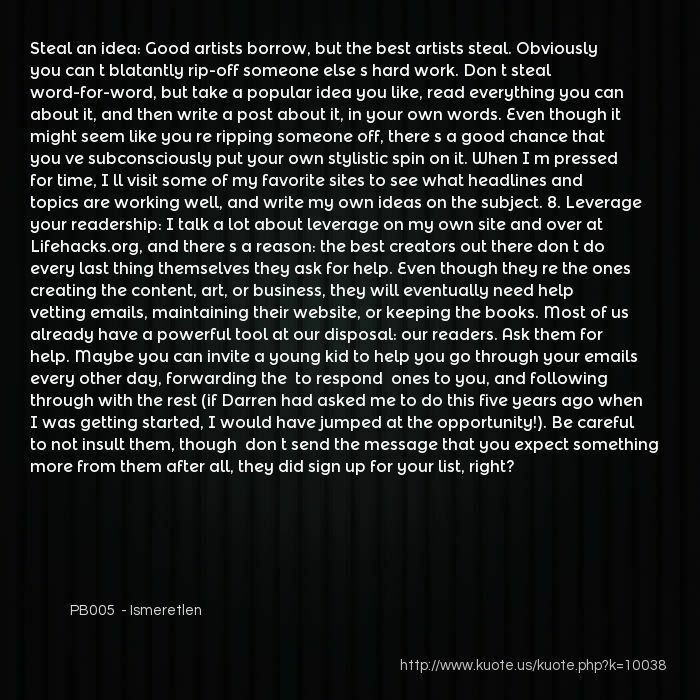 Jon Morrow of ProBlogger Blog Tips – The Blog : @ProBlogger 2012.08.21. http://www.problogger.net/blog/page/16/ 302 / 643 BoostBlogTraffic.com does this, and he’s an awesome writer. 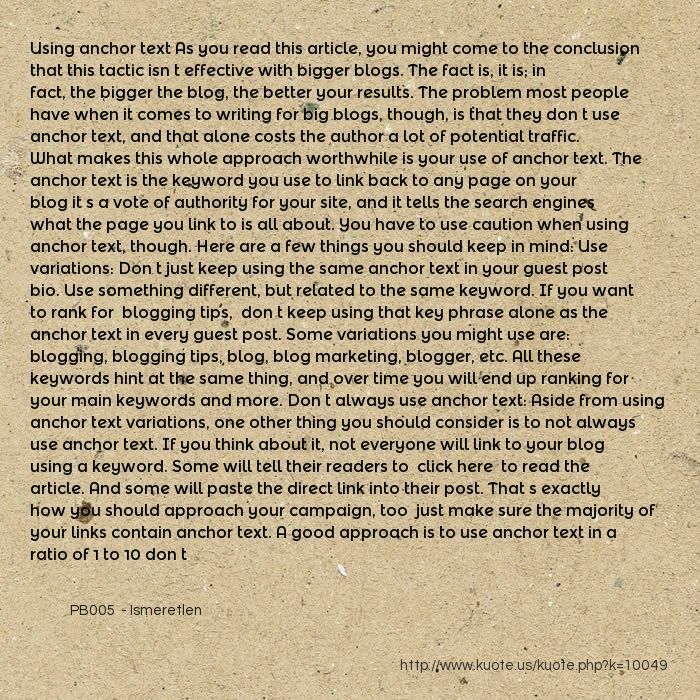 Admittedly, it takes a little while to get set up and dictating properly, but once I got it into working order, I was able to write a few posts per night in one sitting. If this isn’t “leveraging our time and energy,” I don’t know what is! Steal an idea: Good artists borrow, but the best artists steal. Obviously you can’t blatantly rip-off someone else’s hard work. Don’t steal word-for-word, but take a popular idea you like, read everything you can about it, and then write a post about it, in your own words. Even though it might seem like you’re ripping someone off, there’s a good chance that you’ve subconsciously put your own stylistic spin on it. When I’m pressed for time, I’ll visit some of my favorite sites to see what headlines and topics are working well, and write my own ideas on the subject. 8. Leverage your readership: I talk a lot about leverage on my own site and over at Lifehacks.org, and there’s a reason: the best creators out there don’t do every last thing themselves—they ask for help. Even though they’re the ones creating the content, art, or business, they will eventually need help vetting emails, maintaining their website, or keeping the books. Most of us already have a powerful tool at our disposal: our readers. Ask them for help. Maybe you can invite a young kid to help you go through your emails every other day, forwarding the “to respond” ones to you, and following through with the rest (if Darren had asked me to do this five years ago when I was getting started, I would have jumped at the opportunity!). Be careful to not insult them, though —don’t send the message that you expect something more from them—after all, they did sign up for your list, right? 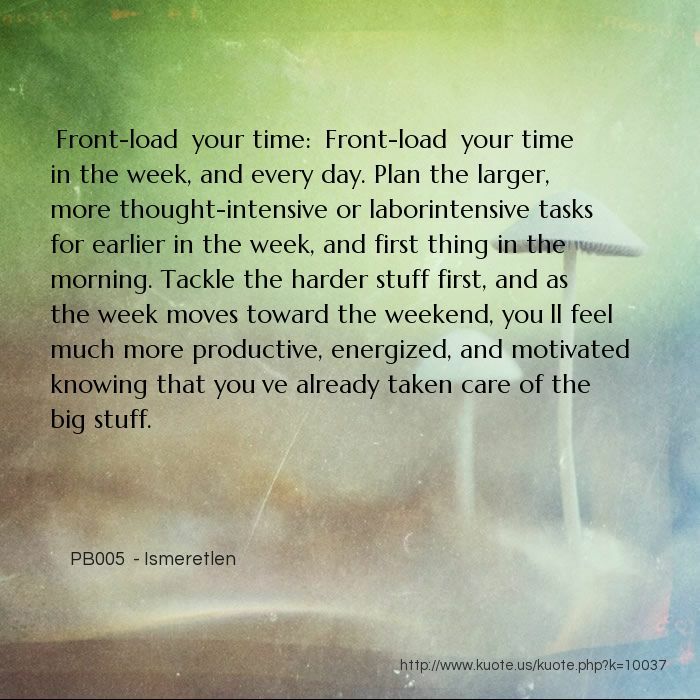 “Front-load” your time: “Front-load” your time in the week, and every day. Plan the larger, more thought-intensive or laborintensive tasks for earlier in the week, and first thing in the morning. Tackle the harder stuff first, and as the week moves toward the weekend, you’ll feel much more productive, energized, and motivated knowing that you’ve already taken care of the big stuff. 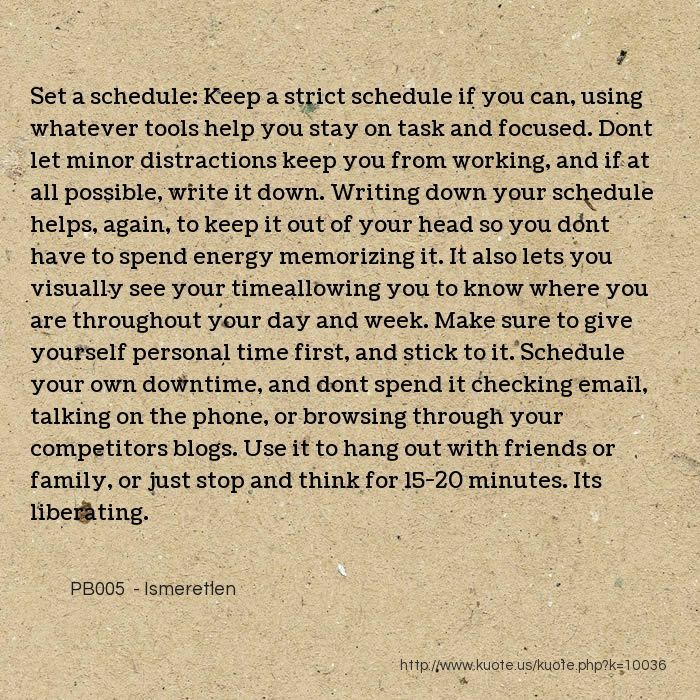 Set a schedule: Keep a strict schedule if you can, using whatever tools help you stay on task and focused. 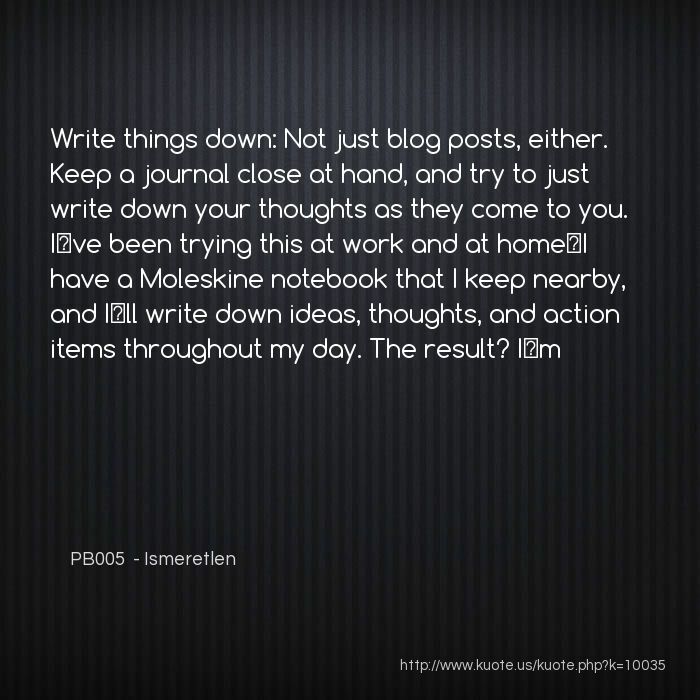 Don’t let minor distractions keep you from working, and if at all possible, write it down. Writing down your schedule helps, again, to keep it out of your head so you don’t have to spend energy memorizing it. It also lets you visually see your time—allowing you to know where you are throughout your day and week. Make sure to give yourself personal time first, and stick to it. Schedule your own downtime, and don’t spend it checking email, talking on the phone, or browsing through your competitors’ blogs. Use it to hang out with friends or family, or just stop and think for 15-20 minutes. It’s liberating. Adding the posts to post-conference link lists and blog roundups. An ad in your sidebar for three, six, nine, or 12 months. You’ll mention and link to the brand from your social media platforms. You’ll include a link to their site from your newsletter for the duration of the sponsorship. You’ll use brand products at the conference such as pens, notepads, tote bags, etc. You’ll mention the sponsor on the back of your business card. These are just suggestions—it’s up to you to offer items that you feel comfortable with, and which suit your blog and audience. Whatever you choose, make sure you over-deliver and provide real value to your sponsor. 4. 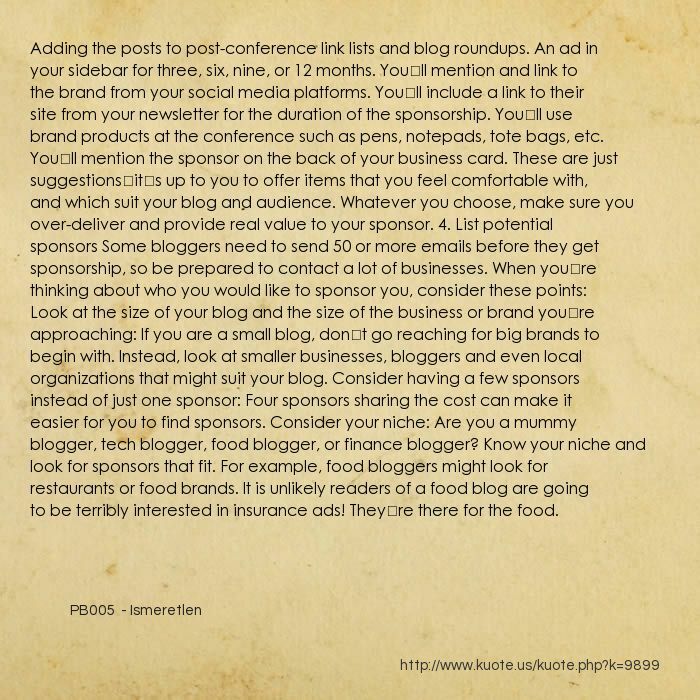 List potential sponsors Some bloggers need to send 50 or more emails before they get sponsorship, so be prepared to contact a lot of businesses. When you’re thinking about who you would like to sponsor you, consider these points: Look at the size of your blog and the size of the business or brand you’re approaching: If you are a small blog, don’t go reaching for big brands to begin with. Instead, look at smaller businesses, bloggers and even local organizations that might suit your blog. Consider having a few sponsors instead of just one sponsor: Four sponsors sharing the cost can make it easier for you to find sponsors. Consider your niche: Are you a mummy blogger, tech blogger, food blogger, or finance blogger? Know your niche and look for sponsors that fit. 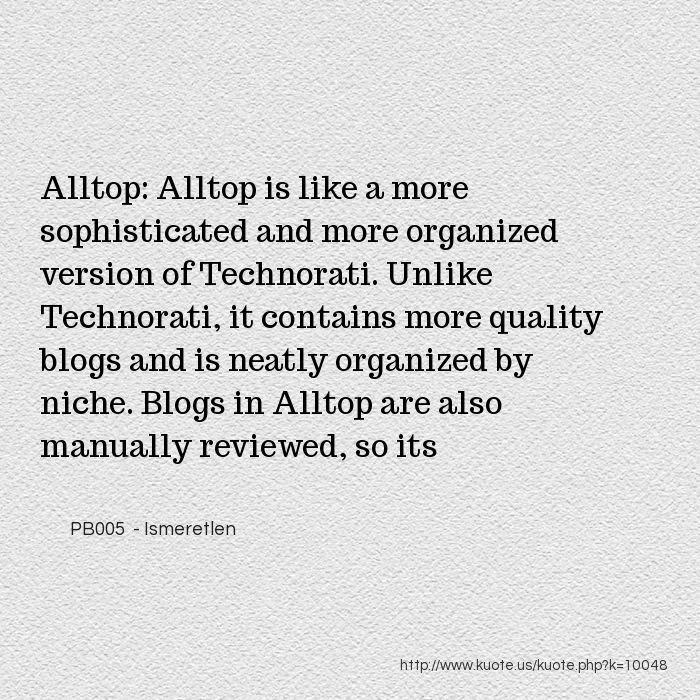 For example, food bloggers might look for restaurants or food brands. It is unlikely readers of a food blog are going to be terribly interested in insurance ads! They’re there for the food. Mothers: Studies have shown that women who are mothers respond poorly to promotions and products that use hype to sell their benefits. These women are highly practical and intelligent, but they’re also tired and overworked. They just want honest, trustworthy products and landing pages that don’t “over-promote”. Women in general don’t like unrealistic marketing. Male teenagers: Studies have shown that male teenagers, on the other hand, are more likely to be interested in quick fixes. A generation of boys raised with video games, mobile phones, and the web generally show less patience and a greater desire for instant gratification than other market segments. 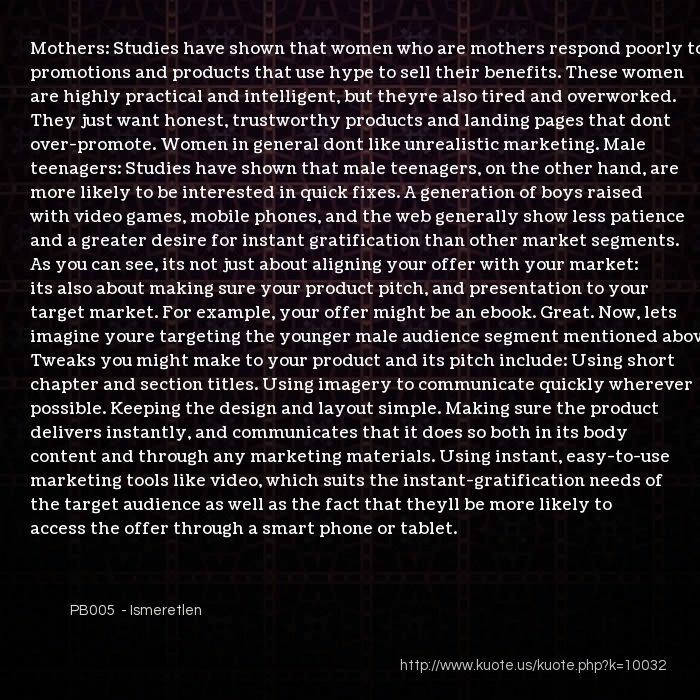 As you can see, it’s not just about aligning your offer with your market: it’s also about making sure your product pitch, and presentation to your target market. For example, your offer might be an ebook. Great. Now, let’s imagine you’re targeting the younger male audience segment mentioned above. Tweaks you might make to your product and its pitch include: Using short chapter and section titles. Using imagery to communicate quickly wherever possible. Keeping the design and layout simple. Making sure the product delivers instantly, and communicates that it does so both in its body content and through any marketing materials. Using instant, easy-to-use marketing tools like video, which suits the instant-gratification needs of the target audience as well as the fact that they’ll be more likely to access the offer through a smart phone or tablet.